My brother and I ate pancakes often when we were kids, and they were always prepared by Mom. While we occasionally would have Bisquick pancakes, usually our pancakes were made with one of Mom’s two sourdough starters. The one starter gave pancakes that were thin and airy, while the other sourdough pancakes were thick, slightly crispy on the outside, and soft in the center; the thick ones were always my favorite, and I have that very starter in my refrigerator right now. I don’t know exactly how old that sourdough starter is, but I believe it is at least 30. 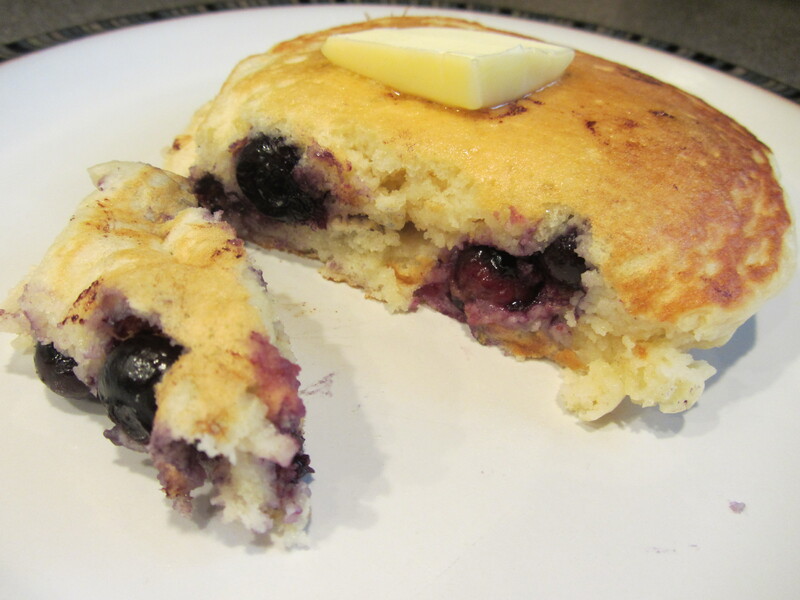 Mom almost always made a blueberry sauce to go with our pancakes, and I vividly remember fights over every spoonful, and especially the very last spoonful. Mom, in her apron, often had to mediate, deciding which one of us would get that final bit of sauce, and promising that the other of us would get it next time. Dad, in his shirt and tie, would hide behind his newspaper shield, ignoring the commotion to the best of his ability, while eating his own share of the blueberry goodness. Ah, the beauty of the family pancake breakfast. Seeing as we are starting a four-day mini vacation today, what better way to begin the day than with homemade pancakes? Last evening I watched the 34th episode of Good Eats, and quickly mixed up a batch of Alton Brown’s instant pancake mix. 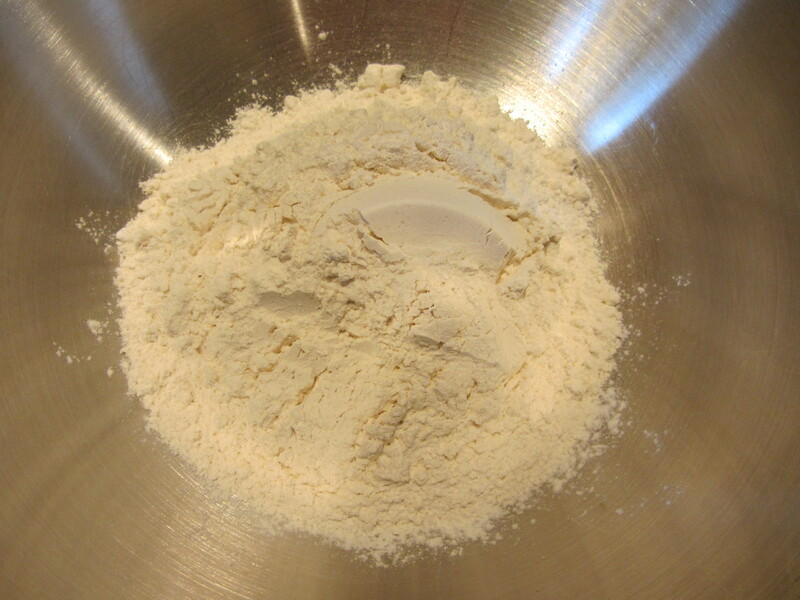 Pancake mix ingredients: flour, baking soda, baking powder, Kosher salt, and sugar. 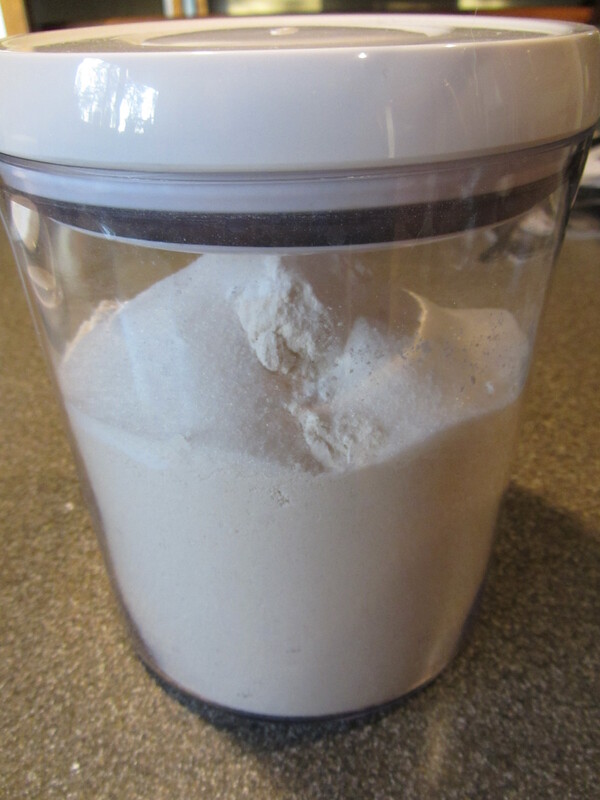 To make his mix, into a lidded container scoop 6 C of all-purpose flour; the moderate protein content of AP flour is ideal, as low-protein flours (like cake flour) result in pancakes that are too soft and light, while high-protein flours (such as bread flour) yield pancakes that are too dense and tough. 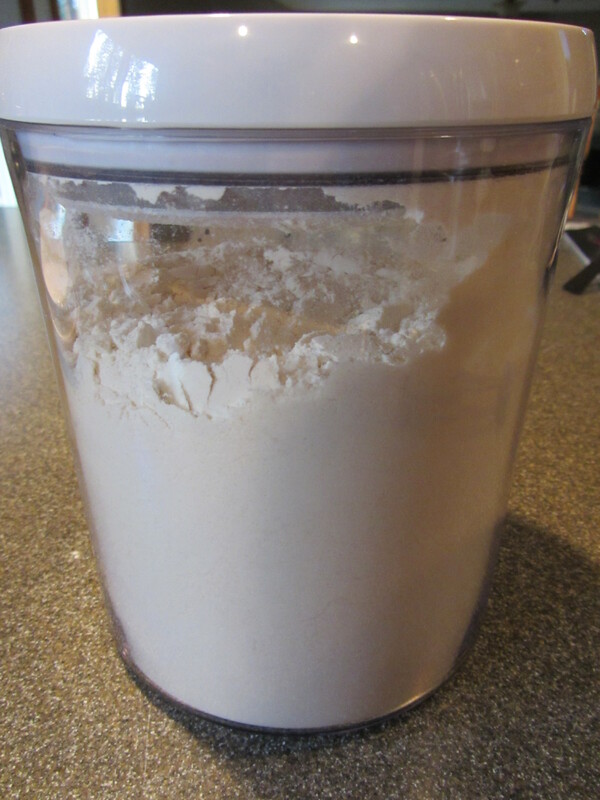 Prior to scooping your flour, give it a good shake to aerate grains, as this will result in a more accurate measurement. 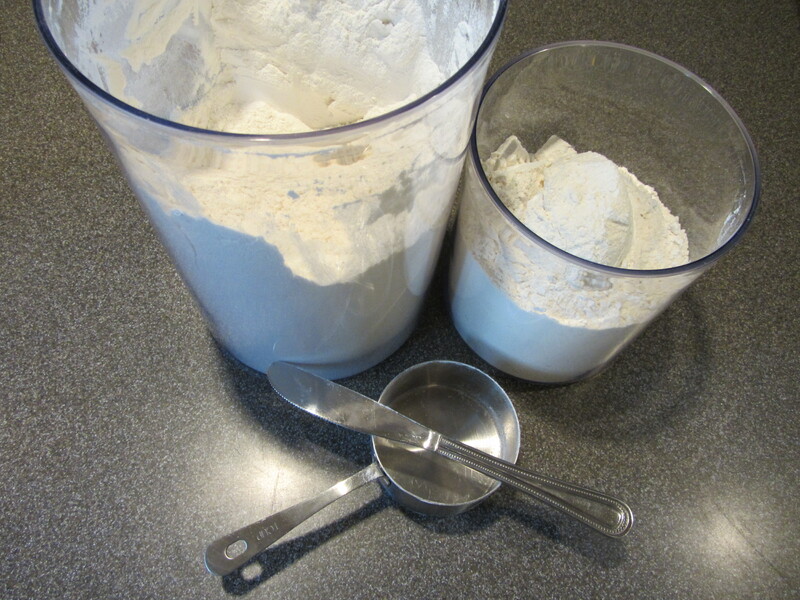 Spoon 6 C of flour into a lidded container. 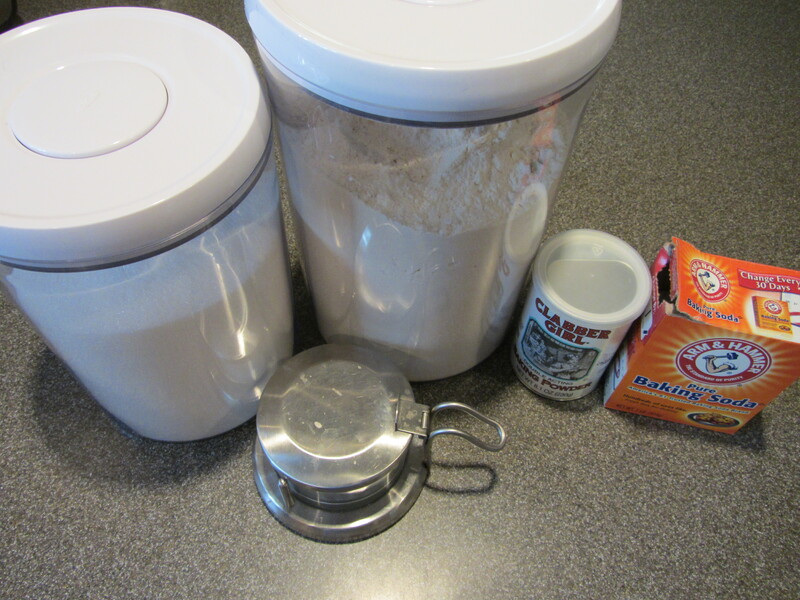 To the flour, add 1.5 t of baking soda, 1 T of baking powder, 1 T of Kosher salt, and 2 T of sugar. 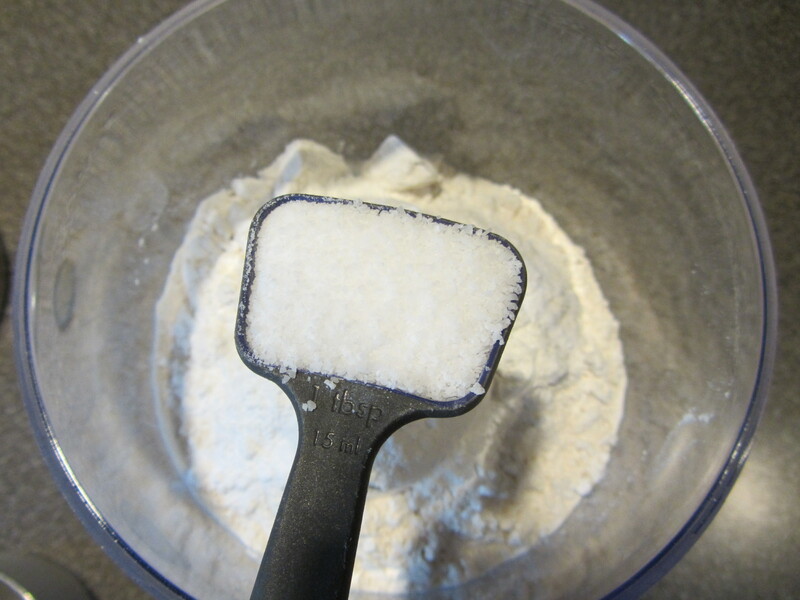 Add 1.5 t baking soda. Add 1 T baking powder. Plus a tablespoon of Kosher salt. Shake the mix well and use within three months. 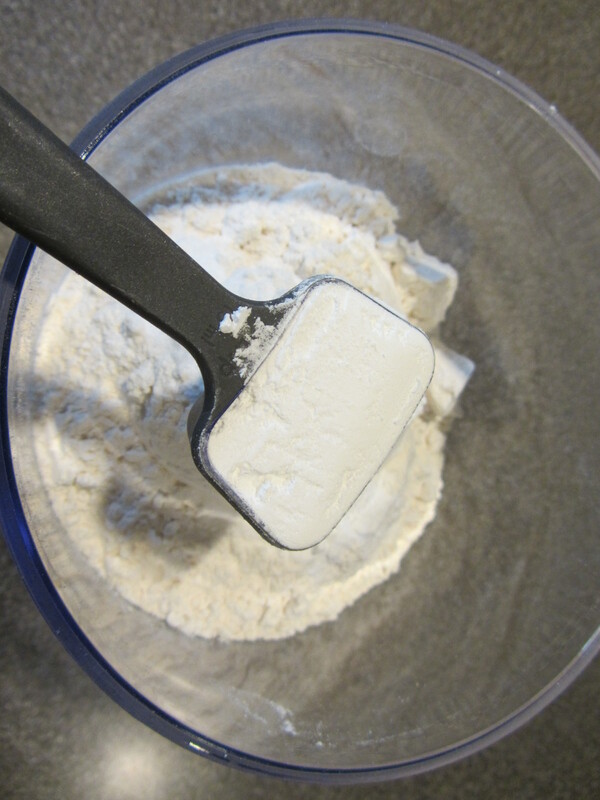 Note: This recipe can easily be scaled up or down – just use the following formula: 1/4 t baking soda per cup of flour, 1/2 t baking powder per cup of flour, 1/2 t Kosher salt per cup of flour, and 1 t sugar per cup of flour. When ready to make your pancakes, for every 2 C of pancake mix, you will need 4 T of melted butter, 2 C of buttermilk, and 2 eggs, separated. Oh, and fruit, if you want to have fruit in your pancakes. Alton used blueberries in the episode. 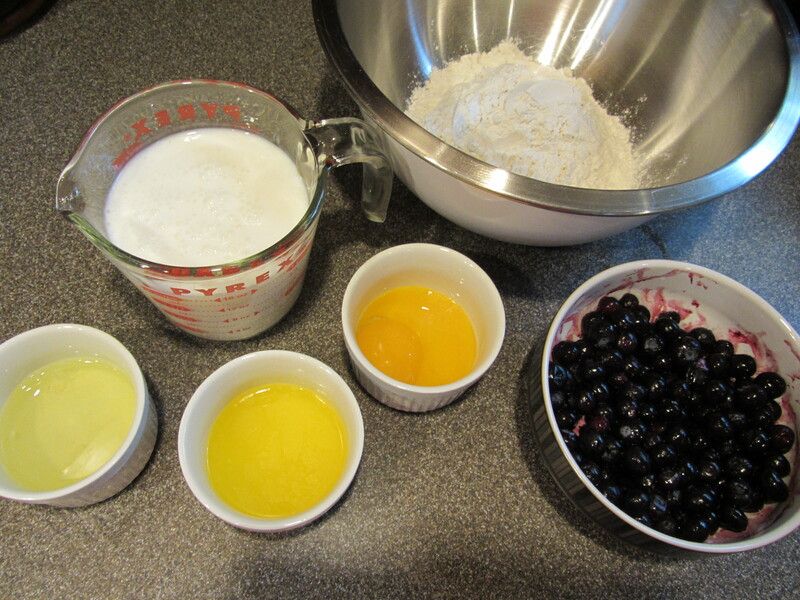 Pancake ingredients: 2 C pancake mix, 2 C buttermilk, 4 T melted butter, blueberries, and 2 eggs, separated. 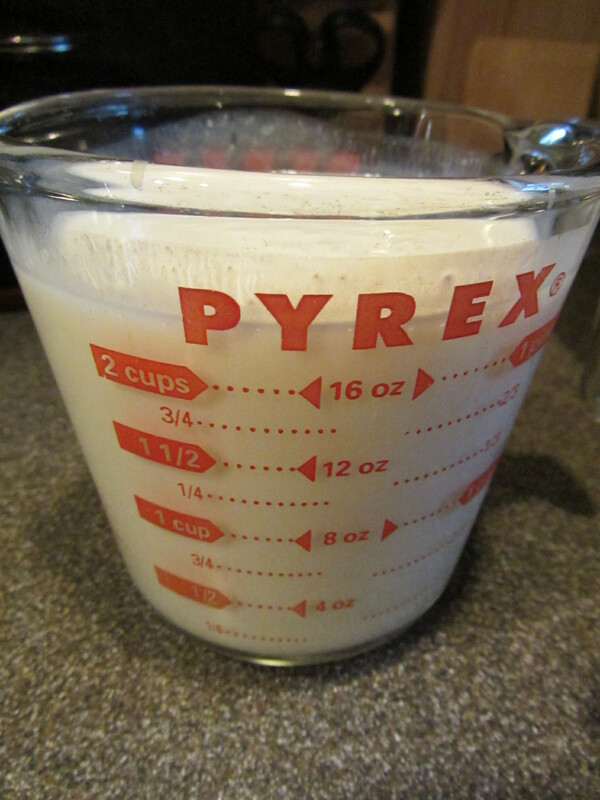 To give you an idea of how much mix to use, for us this morning, 2 C of pancake mix gave us 9 pancakes, made using a 3 oz. 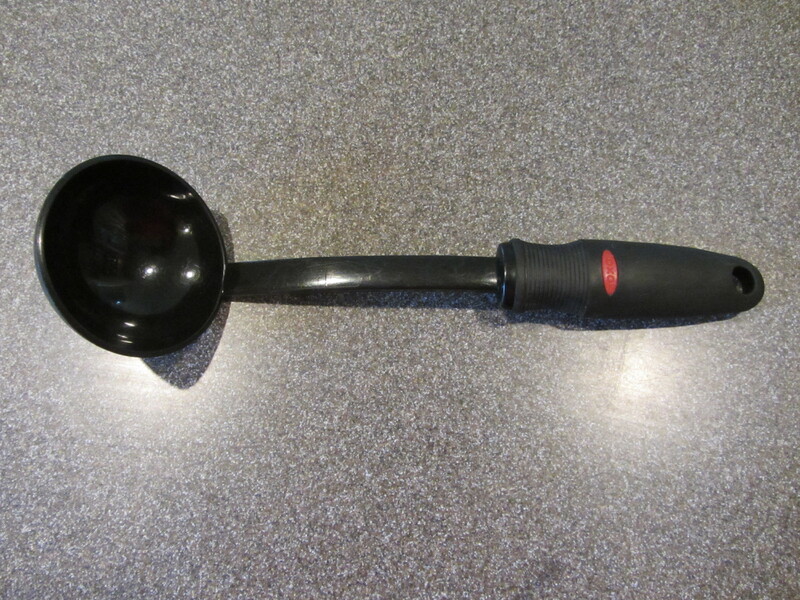 ladle. 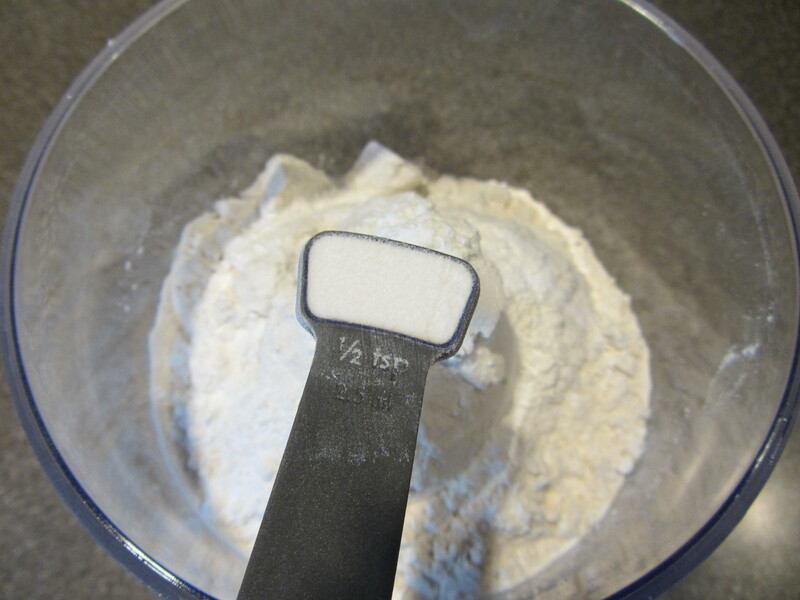 Measure your dry pancake mix into a large bowl. 2 C of pancake mix in a large bowl. 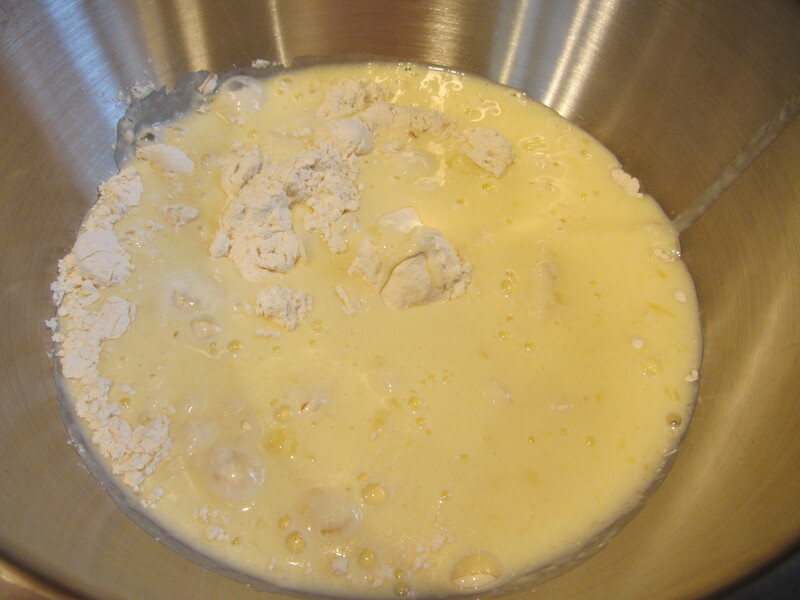 For the liquid ingredients, buttermilk and butter go together like oil and water, so, for proper mixing, add the egg whites to the buttermilk and mix with a fork; since egg whites are mostly water, they will mix easily with the buttermilk. 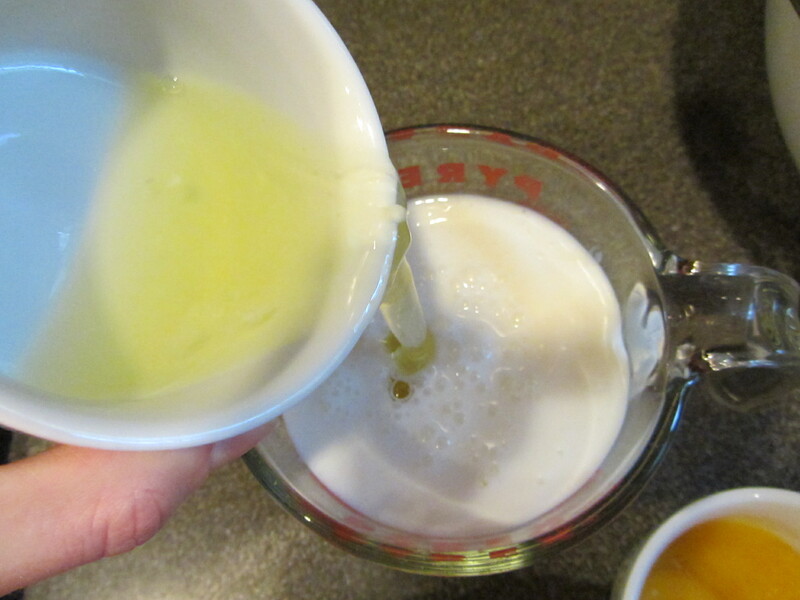 Adding egg whites to buttermilk. 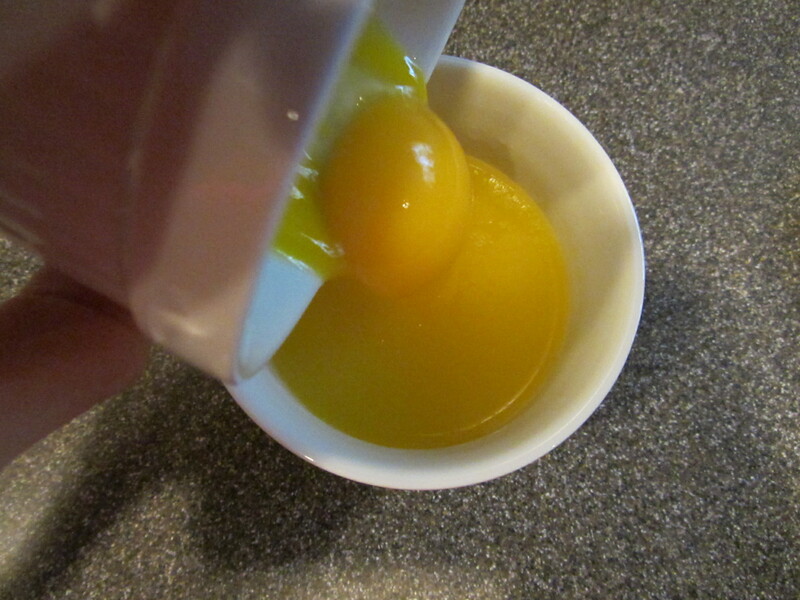 Separately, add the egg yolks to the melted butter; the yolks will mix well with the butter because their lipoproteins like both fat and water. 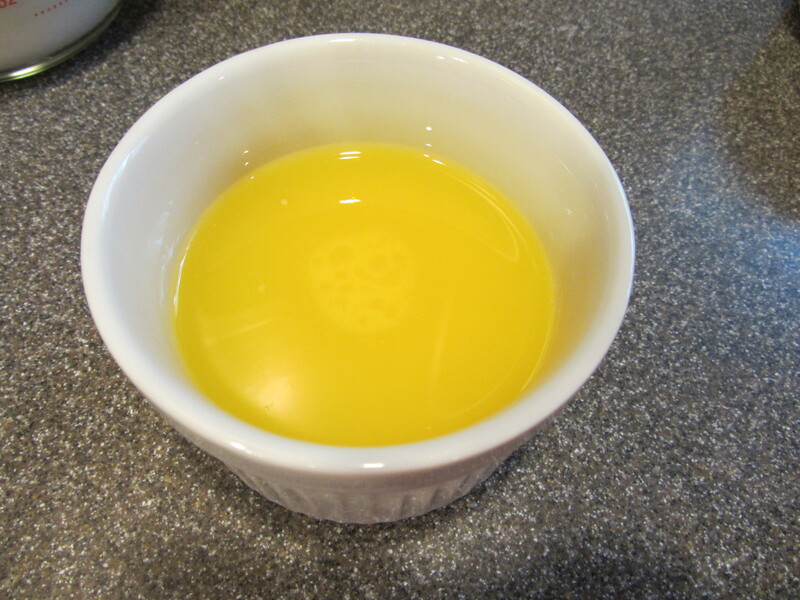 Adding egg yolks to melted butter. 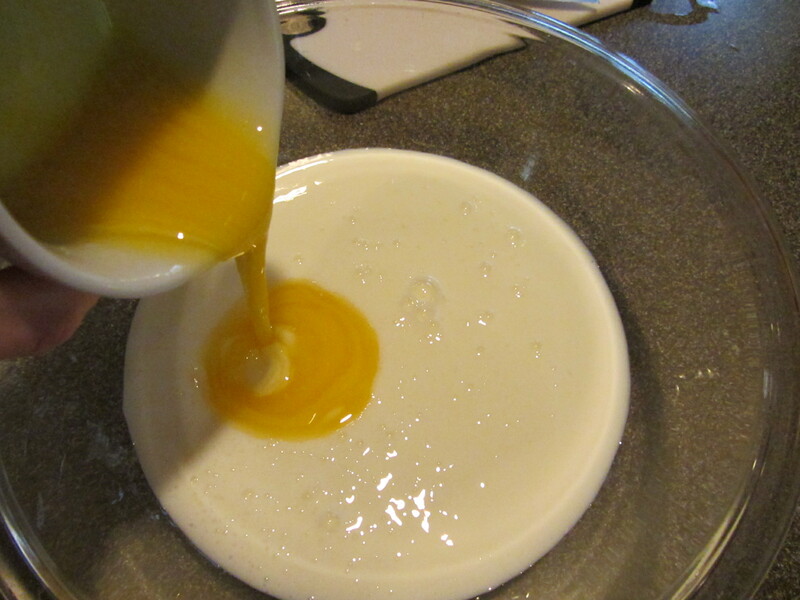 Finally, combine the egg white/buttermilk mixture with the egg yolk/butter mixture, and whisk. Once combined, heat a griddle or skillet to 350 degrees. If you plan to serve pancakes to numerous people at once, you will also want to put a towel-lined baking sheet in your oven and heat it to 200 degrees. We do not have a griddle, so I used a large, heavy-duty nonstick skillet. 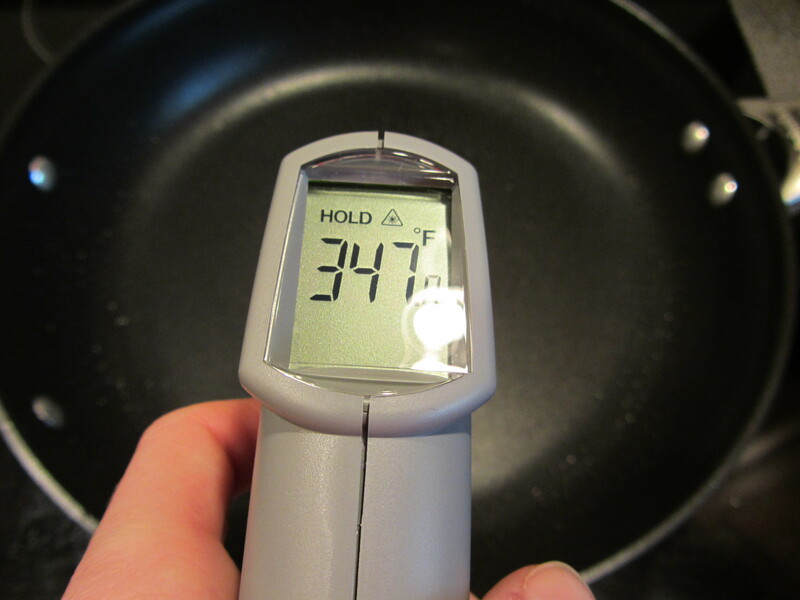 I was given an infrared thermometer for Christmas, so I used that to determine when my skillet had reached 350 degrees. If you do not have an electric griddle or an infrared thermometer, you can tell that your skillet is ready when water droplets dance on the surface. 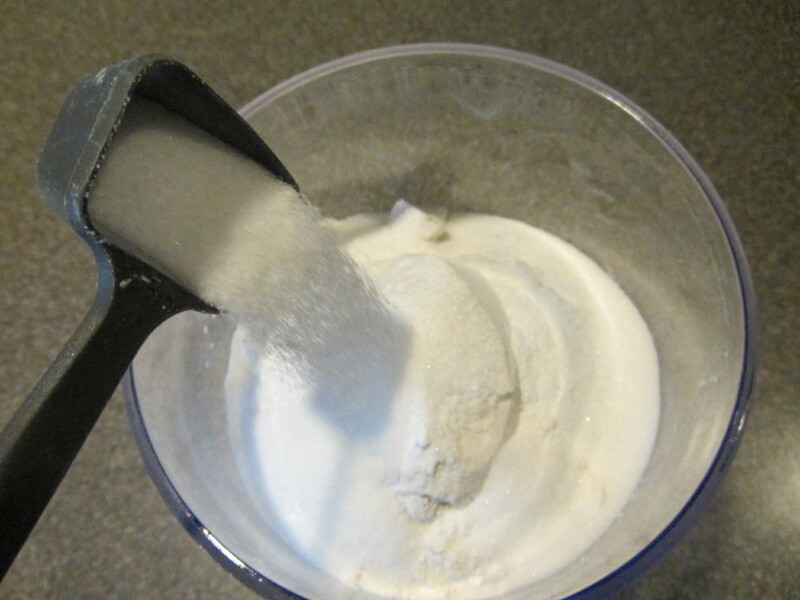 When your cooking surface is heated, add the wet ingredients to the dry ingredients, and mix just until combined. 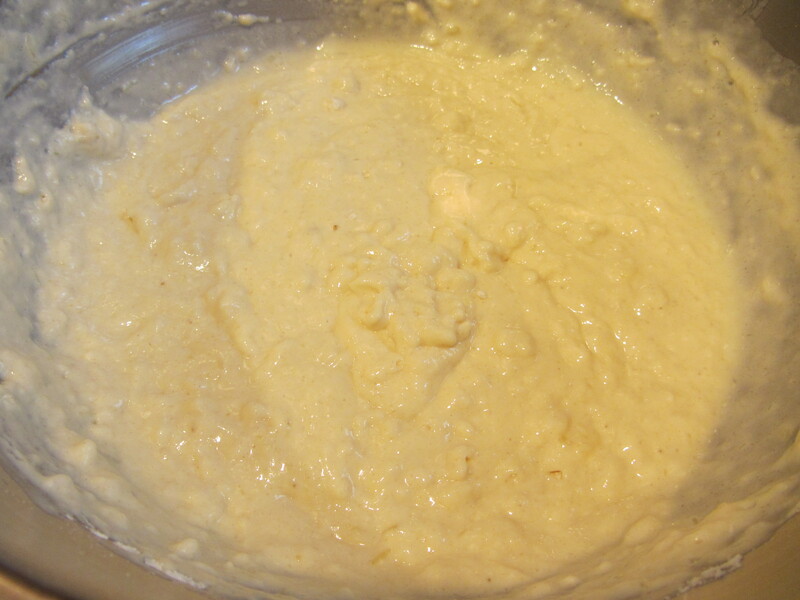 You do not want to over-mix your batter, and do not worry about lumps, as they will cook out. Adding wet ingredients to dry ingredients once the pan is hot. Mix just until barely combined. 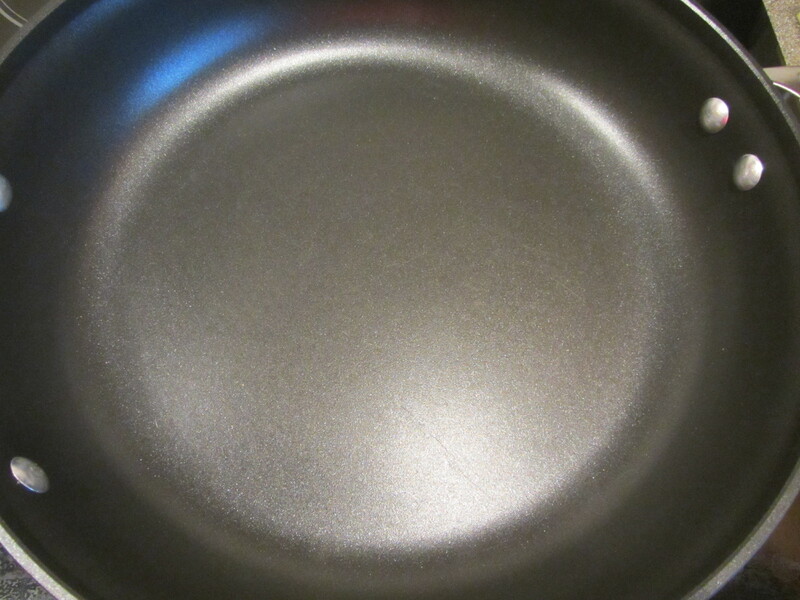 Lube your hot pan by rubbing it with a stick of butter, and then wipe it with some paper towels until no fat is visible on the pan. 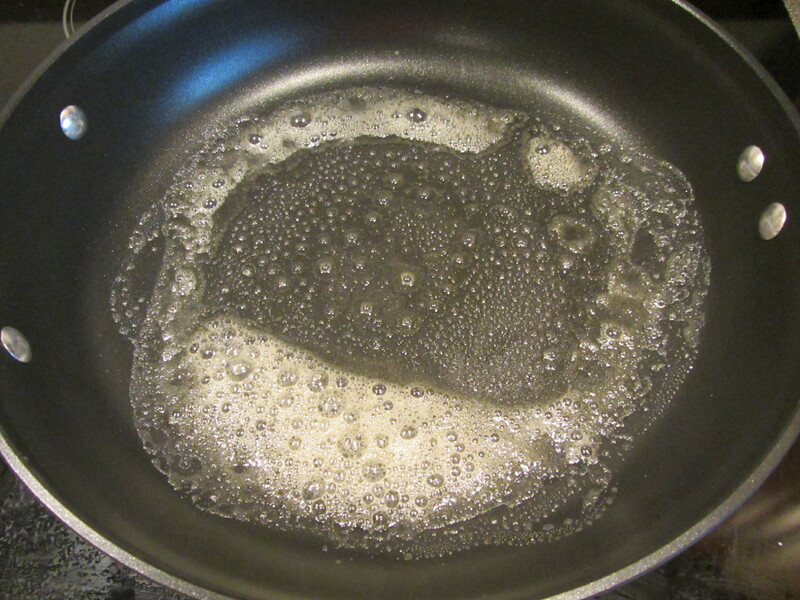 Hot pan lubed with butter. Using a 3 oz. ladle, gently spoon pancakes onto the pan. 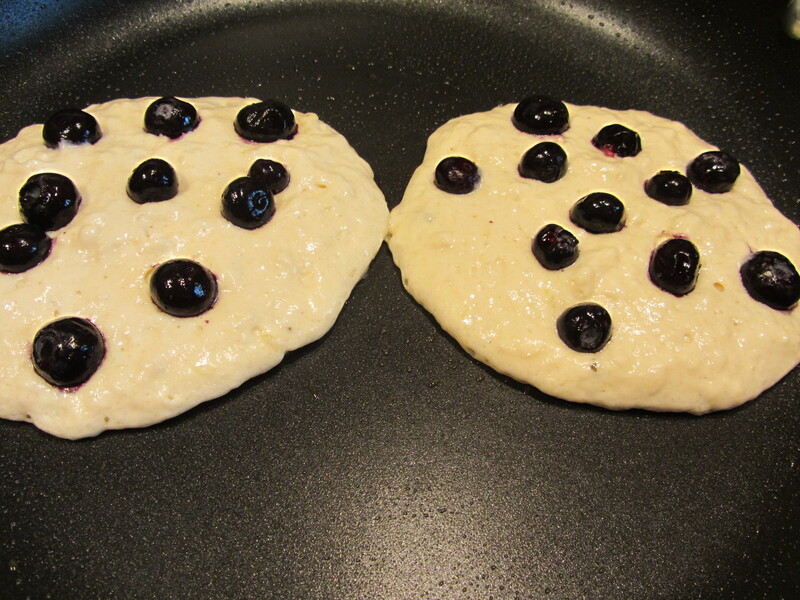 If you want to add fruit to your pancakes, sprinkle it onto the pancakes now. 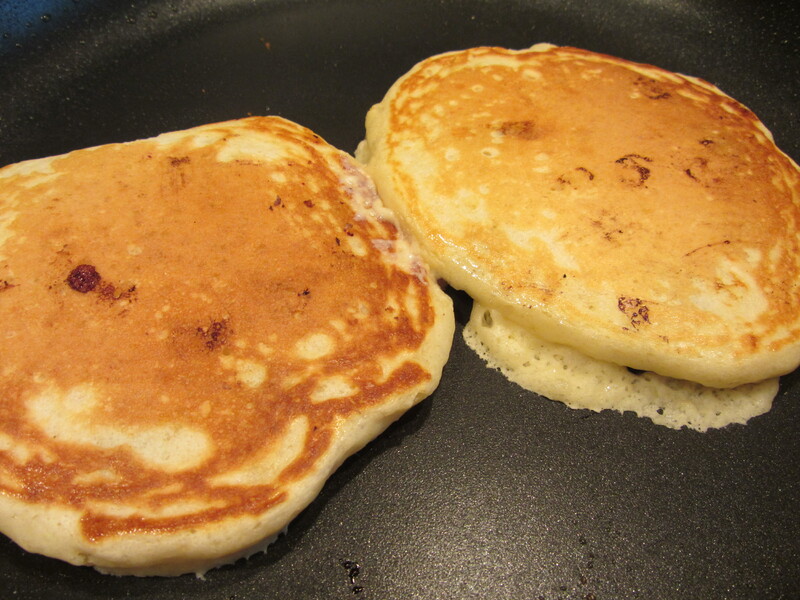 Cook the pancakes until bubbles set around the edges and the undersides are golden brown. Flip the pancakes and cook the second sides until they, too, are golden brown, which should take about half as long as for the first sides. You can hold the pancakes in your warm oven for 20-30 minutes, or serve them immediately with butter and real maple syrup. I opted to eat mine with just butter. 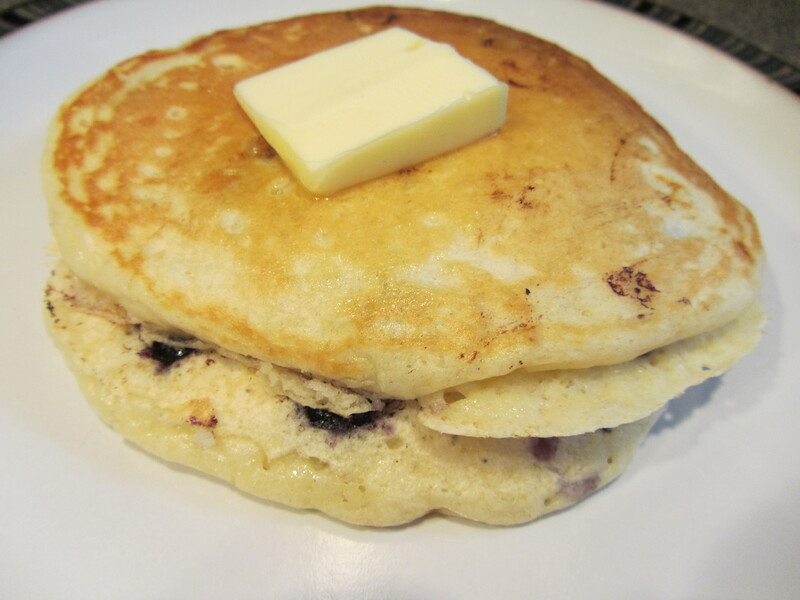 If you have leftover pancakes, Alton says you can cool them completely on a cake rack, wrap them individually in paper towels, and freeze them in a plastic bag; they can be reheated in a toaster or microwave. We had five extra pancakes, and they are in the freezer as I type. We thought these pancakes were really good, and they cooked up very nicely. They were thick, fluffy, golden brown, and slightly crispy on the outside. The tang from the buttermilk was evident, and paired well with the sweetness of the blueberries. Chopped bananas would also be good in these pancakes. Perhaps I will be making these pancakes when our family comes to visit next week. We may not have any chocolate chip cookies left (see my previous post here) but we do have pancake mix! 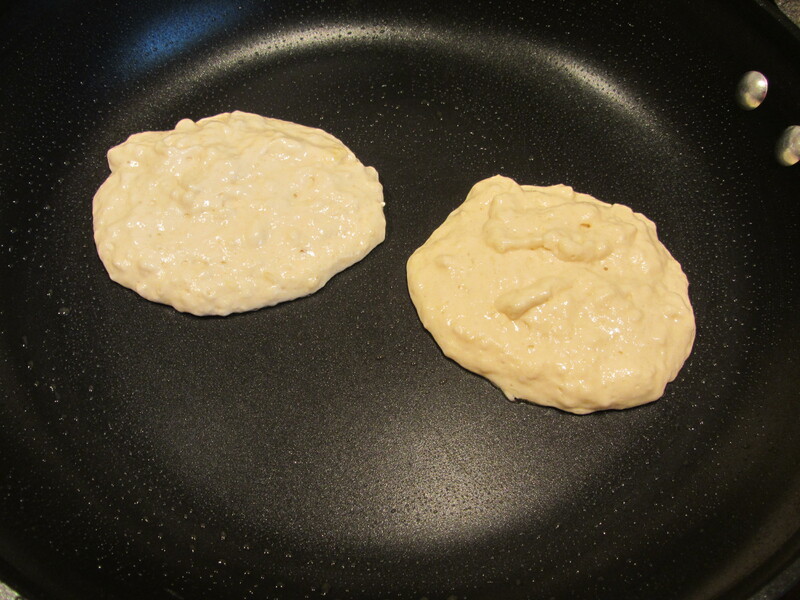 If you are looking for a good, fast pancake recipe that is superior to commercial mixes, Alton’s pancakes are great.